On any given Saturday or Sunday, from early September through late November, the fields of Prospect Park in Brooklyn reflect a moving tableau of colors, as hundreds of young athletes in bright colors chase one another in what looks like an official sport, but with the playful zeal of say, tag, or capture the flag. A ball is hiked, and an offense goes into motion. A running back sells a fake and plunges up the middle pretending to carry the ball, as the quarterback slips it to another player who turns up the sideline to sprint…until his flag is snatched and the whistle blows. 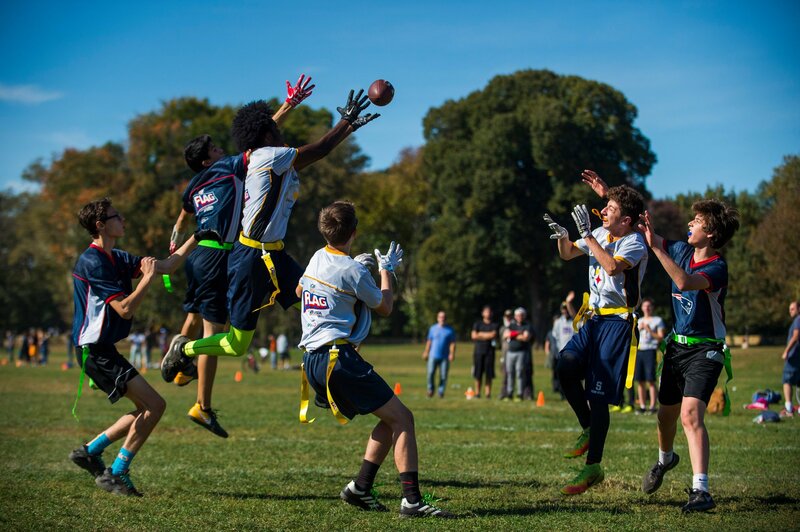 This is flag football, one of the fastest growing organized sports in New York. Asphalt Green, a youth sports powerhouse on Manhattan’s Upper East Side, went from registering 45 players in 2007 to over 500 this year. 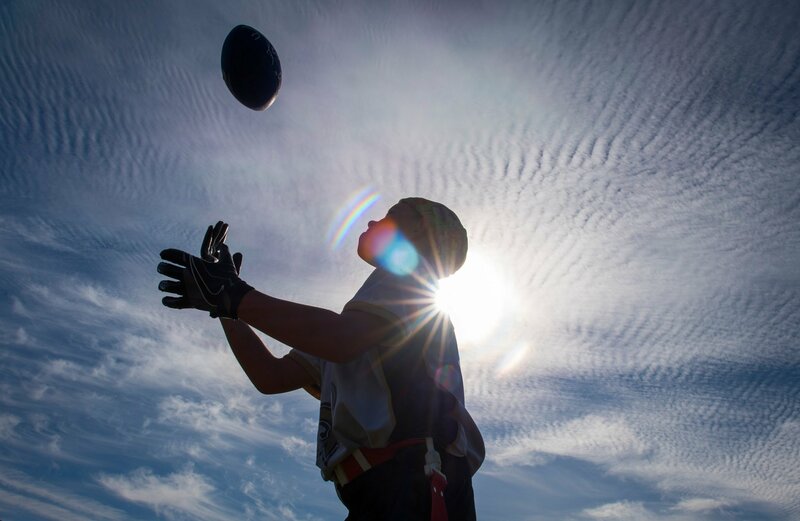 At the Yorkville Youth Athletic Association, also based on the East Side, flag football could surpass baseball in terms of demand in a few years, said Arlene A. Virga, Yorkville’s executive director. In Brooklyn, it has become so popular that on weekends in the fall, two different youth leagues overwhelm the green spaces of some of Brooklyn’s most prominent parks. 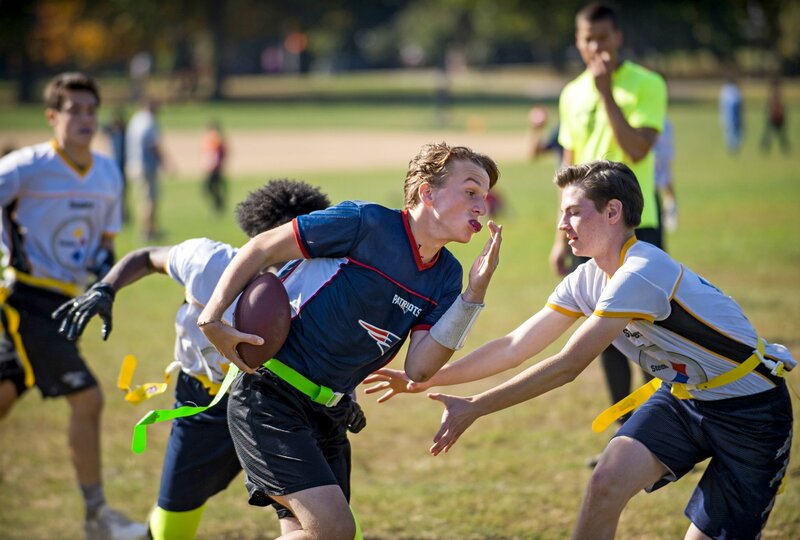 In Prospect Park, 65 teams, featuring roughly 650 uniformed players, boys and girls from 7 to 17, all with flags draped down each hip, compete from morning through the late afternoon on five fields. The games are officiated by a team of referees, under the auspices of the St. Francis Xavier (SFX) Youth Sports flag football commissioner, Tom Henderson. Raised in Sunset Park, Mr. Henderson, 59, grew up playing tackle football in Brooklyn’s recreational and semipro leagues. He looks like a throwback gridiron guy; all girth and energy, with engaged eyes and a head of wild, white hair that blows in the wind. Usually helping him on the weekends are his son, Tom Jr., who grew up playing in the league, and a cadre of teenage referees who hang out by Mr. Henderson’s unofficial office, the equipment station by the fields. “We started with six teams in 2007,” he said. “The heart and soul was Barbara,” he added, referring to his late wife. “She did all the hard work. All I did was talk to people in the park.” Mr. Henderson said that he and his wife heard about the sport and started the league a decade ago, when Tom Jr. and his friends wanted to play football. In 2009, a second league, sponsored by the 78th Precinct Youth Council, formed in the same part of Brooklyn. Today, over 400 boys and girls compete on nearly every free patch of turf in Brooklyn Bridge Park and a couple of other locations in the borough. The only thing prohibiting more growth is available space, said Josh Hernández, the 78th Precinct’s director of basketball and flag football operations. He understands the sport’s appeal. With mounting clinical studies and jarring autopsies of former players, participation in tackle football is on decline for youth throughout America. But Mr. Henderson and Mr. Hernandez believe that the essence of the game doesn’t depend on tackling. The sport is played five-on-five over two 20-minute halves. The games are fast-paced and intense. Despite the no-contact rule, it’s football with many of its trappings: uniforms, playbooks, huddles, strategy, movement of every player on every play, running, passing, defensive stands, Hail Marys, scrambling quarterbacks, interceptions, barking coaches, roaring sidelines, and the motherlode phrase for points and glory: Touchdown! Observing from the sidelines, it’s hard not to notice the genuine and infectious level of enthusiasm among the players, their coaches and those there to cheer them on. “Both boys just love it, and as a parent it’s so much fun to watch,” said Melina Mackall of Brooklyn whose two sons, Jackson, 11, and Spencer, 9, play in the 78th Precinct league. Every the moment in a when we pick blogs that we read. Listed below are the most recent sites that we pick out. 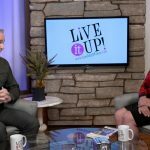 lajknow,Very helpful and best artical information Thanks For sharing. Always a significant fan of linking to bloggers that I adore but really don’t get a good deal of link love from.